The American financial services industry takes up too big a part of our economy. This isnʼt a moral judgement, itʼs pragmatism. The good folks who accept and put to work your deposits, who loan money to individuals and corporations, run mutual funds, and otherwise handle our money donʼt actually lift one brick, plant one potato, cut one personʼs hair, stitch one wound or teach one advanced calculus course. In short, they donʼt DO anything but sit at their computers and shift electronic dollars from one pot to another. Thatʼs a bit of a simplification, but essentially true. 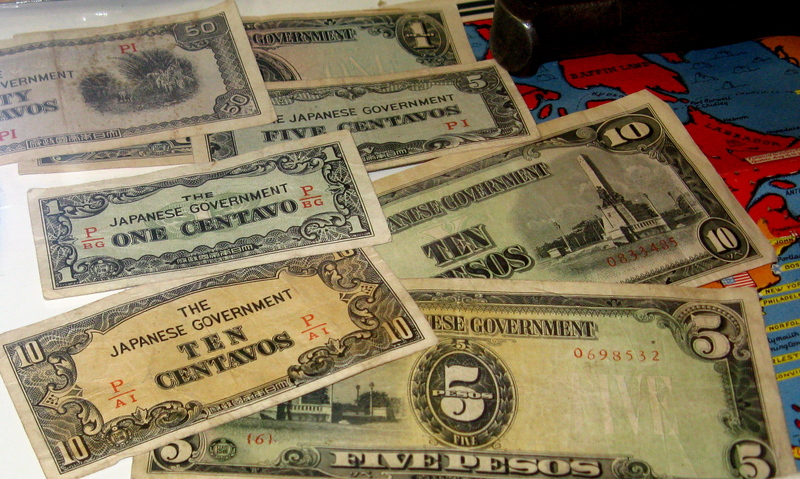 This currency that the Japanese government issued in the captive Philippines during World War II didnʼt last long as a store of value. These days many of our most educated and talented people chase similar pieces of paper as they build their fortunes. Stock brokers, annuity managers, university investment advisers, reinsurance companies, private bankers for the wealthy, credit card companies, mortgage brokers, life insurance sales people, and mergers and acquisition specialists do necessary work, but this electron shifting shouldnʼt take up such a large percentage of the economy. Having so many do this work is a waste of some of our smartest people, who, instead of fighting for an extra two-tenths of a percent gain for an Eastern European specialty bond fund, could be teaching kids in poor neighborhoods or figuring out how to better protect endangered species. The reason that that Harvard grad is running a hedge fund rather than improving our quality of life is “thatʼs where the money is.” Donʼt blame her. The incentives are skewed. Most of us arenʼt smart enough to correct this imbalance. But wouldnʼt it be nice if one of the private-equity mavens on Page Mill Road would settle for the measly hundred million sheʼs raked in and use her MIT-honed brain to shake up the system so the best and brightest would be drawn to more useful work. Previous post ← Who wears shoes?